John wrote an article for Renderosity Magazine offering advice on how to contract as a designer and (hopefully) inspiring readers with our own projects. John's "Ferrari 360 Spider" image (a sales image for the Ferrari 360 Spider 2000 (for Wavefront OBJ)) won 16th place in the ArtWanted Planes, Trains and Automobiles art contest. John's "Retro Racer in a Field" image (the main image for the Retro Racer (for DAZ Studio)) won 6th place in the ArtWanted THE FUTURE art contest. John's panel talk about video games and digital art at MegaCon was turned into an article in Revolutions - Cosplayers magazine. 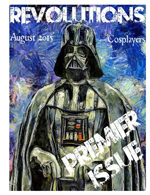 The magazine includes stories, pictures, and interviews from various comic-cons, most notably the San Diego Comic Con. John's All About Me Vendor interview has been published at Renderosity. He talks about his history of making digital artwork, from using an Apple II, all the way up to making digital models. Vanishing Point is featured in issue #1 of 3DMag's French special-edition magazine, Le Guide de la 3D, and includes a number of our models on their cover disc: ElfBlade (for V4), Sentinel Robot Mech, Urban Biker (for V4), and Vincent Parker. Due to a naming typo, the Vanishing Point models were incorrectly labeled as "JCH Digital Designs". Vanishing Point is featured in issue #11 of 3D Artist magazine, and includes our Vincent Parker figure on their cover disc. Vanishing Point is featured in issue #10 of 3D Artist magazine, and includes the Cannon Queen outfit on their cover disc. Vanishing Point is featured in issue #123 of 3D World magazine, with a cover story on modelling and texturing a dropship. This issue includes Vincent Parker, our low-polygon, fully pose-able human figure, for use in Poser. The only international magazine for 3D artists. Each issue provides analysis of latest trends in the market, artistic and technical advice, impartial product reviews, and behind-the-scenes articles on the making of key projects in this fast-paced industry. To purchase back issues, go to the myfavouritemagazines.co.uk ordering page (link opens in new window). In 2010, John's NST Catalan in Space image was accepted in the 2010 ArtWanted Page-a-Day Calendar. This image was printed on the 'tear-off' page for Nov 30, 2009. Vanishing Point is featured in issue #117 of 3D World magazine, with a cover story on instructional training. This issue includes a few high-polygon cars in multiple formats from us. In 2008, John's Force of One image was accepted in the 2009 ArtWanted Page-a-Day Calendar. This image was printed on the 'tear-off' page for July 27, 2009. The "Force of One" image is a larger version of sales image #3 (the orange soldier on a blue background) for the Project Soldier model. An interview with John and Vanishing Point is featured in this month's issue. Sublime Digitals is a PDF magazine distributed by 3DSublime and is offered for free to the graphics community. You can download it from their website or from ShareCG (link opens in new window). An interview with mrsparky is featured in this month's issue. Imagine FX, the leading publication for Digital Sci-Fi and Fantasy Artists have awarded our Modular Science Fiction Environment 4 out of 5 "hands" in a review in their latest issue, #21. As we don't want to spoil the fun - to order a copy and read the review for yourself please visit ImagineFX. Vanishing Point is featured in issue #94 of 3D World magazine, with a cover story on the new Transformers movie. This issue includes Lycantar Alternating Robot (for Poser), by JHoagland and mrsparky, for free. An interview with the Vanishing Point team and De Espona is featured in this issue of 3rd Dimension Graphics. 3rd Dimension Graphics is a PDF magazine distributed by Burst Toast Design and is offered for free to Poser users. Vanishing Point is featured in issue #92 of 3D World magazine. This issue includes a free rifle collection made by Panos and converted to various formats, including: Poser, Vue, Cinema4D, Lightwave, and more. Vanishing Point is featured in issue #91 of 3D World magazine. This issue includes a free M1A1 "Abrams" Tank, made by the people at Gunpoint-3D and converted to Poser format by Helgard. This model includes opening hatches and accurate tread movement. In 2007, John's Tabby 2 In Blue Portrait image was accepted in the 2008 ArtWanted Page-a-Day Calendar. This image was printed on the 'tear-off' page for March 31, 2008. In 2006, John's Tabby Portrait 3 image was accepted in the 2007 ArtWanted Page-a-Day Calendar. This image was printed on the 'tear-off' page for July 27, 2007. Vanishing Point is featured in issue #7 of ImagineFX, which includes both a one-page write-up and two of our models on their cover DVD. Imagine FX is the only magazine for Fantasy and Sci-Fi artists. Each issue contains an eclectic mixture of in-depth workshops from the world's best artists, galleries and interviews, features, community news, software and hardware reviews, and the latest sci-fi and fantasy films and comics. To purchase back issues, go to the myfavouritemagazines.co.uk ordering page (link opens in new window). In 2005, John's Tabby 2 With Glass and Red Dress image was accepted in the 2006 ArtWanted Page-a-Day Calendar. This image was printed on the 'tear-off' page for July 27, 2006.